Brain Scanning: Control things with your mind! When you enter the office and a package is waiting for you with new gadgets, the week just starts right. Our crew likes to check what they offer and how we can creatively „misuse“ them. Brain scanners are one of this kind: They already exist for many years in a professional health market and recently became available to consumers. We play around with one brain scanner in our lab to see how we could integrate this creatively into media installations. The scanner we use is basically a EEG headset for a user. 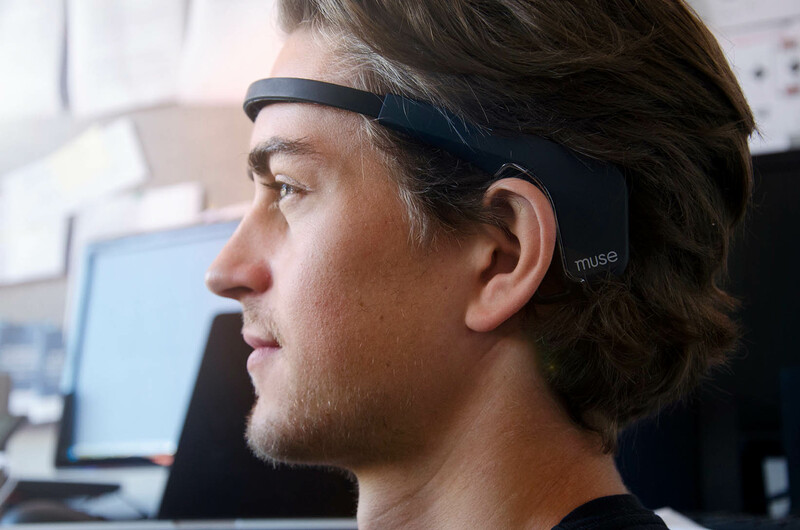 It holds several sensor fields that are pressed against the head and read out brain activity. There are different models of scanner that vary mainly in number and precision of sensors included. All data are then sent to an app or PC in realtime from the device via bluetooth, so that no complex cabeling and cable routing to the person is necessary. The very personal stream of brain signal data can shape a multimedia show into an individual and unique experience. We tested several setups and scenarios. Data received can be accessed in „raw“ mode but will deliver a vast and unfiltered noise. This is why producers add a special software to pre-filter the incoming data streams. Do not expect magic from these brain scanners. They offer you some insights into brain activity, but on a limited basic level. No, we cannot read what you think of. No, we cannot scan your brain for your pass word. No, we cannot detect memories or secret wishes in the data stream. There is still a lot of „no“. We could detect if users concentrated and focused on something. This also applies to relaxing and meditation. Interest of excitement can be detected as well. However, the detection precision is not extremely high so that false-positive or false-negative triggers can happen easily when looking for users excitement. We could detect some facial expressions, such as when users closed the eyes or blinked. They fire strong signal peaks. As bottom line, brain scanning offers you an individual reaction during an experience: We are imited to some basic triggers and precision is not 100%, but still in installations, users could influence the show by their brain waves. There are some nice productions that made use of this already. In Richard Ramchurn’s The Moment, users can play film director, using just your brainwaves: The movie has different endings according to the reaction of the viewer wearing a brain scanner. Also, really worth watching is the art performance by Lisa Park: In „Brain Power“ she connected her brain signal to a speaker and gave her brain waves a new stage. Similar is the abstract sound installation „Brain Music“ that composes a dynamic sound experience based on brain waves. We believe this is the potential we still can increase in future media installations: The very personal stream of brain signal data can shape a multimedia show into an individual and unique experience. Every show would be different and unique, just like all our heads and brains are. Don’t you think? –Let’s speak!